NEW HAVEN — When Izzy Juda was 16-years-old and on his way home from school – a crowd of people stopped him outside the Vienna Opera House. Right in front of him was the man who was soon to be the reason that he would not be going to school at all anymore. As a Jew during Hitler’s reign, access to almost everything was restricted. Education, freedom, food, security – the list goes on. As a crowded train left Vienna in 1937, most likely towards a concentration camp, Juda made a conscious decision that he wasn’t waiting to see where that train would take him. He jumped off the moving train in Salzburg, Austria and walked for days over the Swiss Alps. 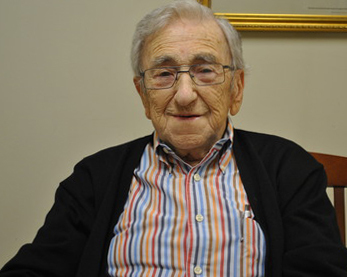 After spending a week in a hospital in Switzerland, he was moved to a Jewish refugee camp. Juda’s parents made it to the United States before he did, but his aunts, uncles and cousins were a few of the millions of victims of the concentration camps, he said. In May 1940, Juda received his United States Visa and traveled to the East Coast. He went on to serve in the U.S Army in 1942 for three years in the Pacific Theatre. He said he was shot in the right leg while in the Philippines, and later went on to have four separate surgeries on his leg for that wound. 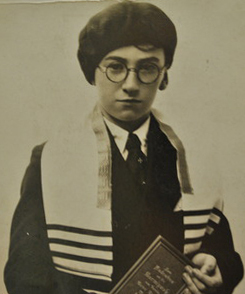 Izzy Juda as a young boy in Austria. As a man who has experienced first hand the detrimental societal changes that Hitler inflicted throughout Europe, Juda provides an unequivocal answer to the biggest change he has seen in his life – the availability of, and access to, everything. After losing so much in his life, Juda said family life is the most important principal to him. Juda said he has seen the dramatic change in the youth of today with the amount of availability they have to the latest technology, and this has made society deteriorate. For 93-year-old Juda, people no longer have respect for the law, for religion or for anything else the way it used to when he was in his youth. “Young people today have too much access to good things – wrong things,” he said. Although Juda said he understands that the development in technology has been a huge change that has been extremely successful, he has seen it put people out of jobs.The E-Z Pass that has become a common component in most cars seen today is a development in technology that Juda has noticed take jobs away from people. The warm voice and soft smile that Juda radiated consistently, supported his statement that he embraces change and chooses every morning, he said, not to be miserable like many people his age tend to be. At 93, Juda said that every morning when he wakes up and his right foot moves forward and his left one follows, he is happy and thankful for another day.